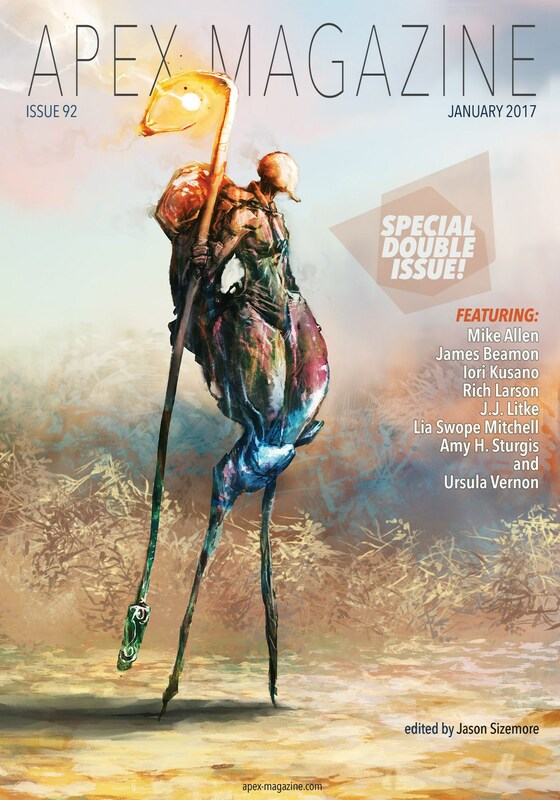 The January 2017 Apex is a Special Double Issue, with brand new short stories by Lia Swope Mitchell, Iori Kusano, James Beamon, and J.J. Litke, a novelette by Ursula Vernon, and reprints from Rich Larson and Mike Allen. Mike’s contribution, “The Quiltmaker,” the sequel to his Nebula nominee “The Button Bin,” is a massive 20,000 word novella which Mike calls “easily my most gruesome published work to date” (and as the guy who edited and published his The Black Fire Concerto, easily the most gruesome novel I’ve ever read, I can tell you that means something). Here’s editor Jason Sizemore with his summation of the January issue. Ursula Vernon returns to our pages with the powerful “The Dark Birds.” This dark fantasy (and dare we say…horror) allegory is my favorite Vernon piece thus far. James Beamon explores time travel and racism in “Soliloquy in a Cheap Diner Off Route 66.” “The Invisible Box” is a fun and quick little story of revenge. “Next Station, Shibuya” by Iori Kusano continues the conversation our magazine has ongoing with Japanase-influenced horror and SF. In “Mag, the Habitat and We” Lia Swope Mitchell’s little protagonists protect and fight for their home. Our two reprints are from Mike Allen and Rich Larson. “The Quiltmaker” is a terrifying dark fantasy/horror novella that will leave a mark. “Masked” by Rich Larson will have you thinking of Black Mirrors, but hey, his story came out before the third season of the show, so we’re giving Rich all the credit for the idea! Our nonfiction includes interviews with cover artist Aaron Nakahara and author James Beamon. Dr. Amy H. Sturgis contributes a scholarly piece titled “The Once and Future Chief: Tecumseh in (Science) Fiction.” Be sure to check out our August, 2017 issue as Dr. Sturgis will be our guest editor and will focus on First Nations and Indigenous authors of North America. Poetry contributors this month include Barton Paul Levenson, Laura Madeline Wiseman, Tracy May Adair, and Amanda Pekar. The Once and Future Chief by Amy H. Sturgis, Ph.D.
We last covered Apex Magazine with the December 2016 issue. This issue’s cover is by Aaron Nakahara. The complete issue is here, and you can buy back issues or subscribe at their website. Our Late January Fantasy Magazine Rack is here. See all of our recent fantasy magazine coverage here.